The Superior® 15-L Manhole High-Output Air/Smoke Blower is designed to inject dense white smoke into sanitary or storm sewers for quick, definitive detection of unwanted inflows and leaks from roof downspouts, drain tiles, leaking manholes, cellar drains, broken laterals, sump pumps, abandoned sewer lines, unconnected sewer lines, cross connected sanitary and storm sewer lines. This High Output Smoke Blower blasts 4,000 CFM of smoke at 4.0 static pressure – more than double the normal output – to push smoke through larger systems requiring greater volume and pressure. The Superior® 15-L uses Superior® Smoke Fluid (sold separately) a proprietary blend, specially formulated for sewer system leak testing. The Superior® 15-L Smoke Blower is engineered to maximize dry smoke output, eliminating the wet smoke and mess typical of other liquid smoke systems. 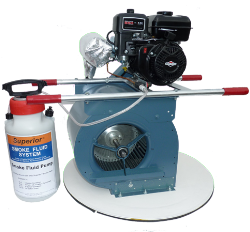 The Superior® 15-L Smoke Fluid System uses micro-control flow valves, custom-machined stainless steel injector nozzles, and custom-welded double-insulated heating chambers to generate the maximum volume of dry smoke. Powered by a dependable 3.5-hp Briggs & Stratton gasoline engine, the blower generates enough pressure to distribute smoke evenly through sewer mains and laterals to reveal inflows and leaks, but not so much pressure as to blow out water traps. The blower housing and belt guard are constructed of heavy-gauge painted mental designed to withstand many years of rigorous field use. Fully assembled, the 65-pound unit features two sets of carry handles and is balanced evenly for easy, two-person carrying. A 27 1/2” diameter custom fiberglass base fits snugly into standard manholes eliminating the need for adapters or a separate manhole cover. The Superior® 15-L Manhole Air/Smoke Blower meets WEF, EPA, and NASSCO recommendations. Proudly made in the USA. Thousands of municipalities in the US and around the world use the Superior® method of Smoke Testing sanitary sewer lines with great success. Hundreds of millions of feet of sanitary sewer mains have been effectively tested using Superior® Smoke products, eliminating surface water inflows and the Sewer System overflows (SSO’s) that result from them. Used widely since 1961, the Superior® Smoke Testing Technique simultaneously leak-tests sanitary sewer mains, house laterals and plumbing. Studies show that over 60% of surface water inflow occurs through house laterals and plumbing. The Superior® Smoke Testing Technique has enabled many sewerage operating authorities to qualify for federal grants under the provisions of Water Pollution Control Public Law 92-500. Smoke Testing not only saves money - it is essential to protecting our environment. Every year over 75,000 SSO’s dump billions of gallons of raw sewage into our sensitive environment. Reducing surface water inflow is the cheapest and fastest way to reduce SSO’s and the pollution caused. High-quality Superior® Smoke Products are made in the USA and are designed to meet the recommendations of NASSCO, EPA & WEF.